Gordon and I both grew up with Dutch oven cooking. Many of my childhood memories include pine trees at a mountain campground, dirty knees, and the smell of chocolate cherry cobbler cooking in a Dutch oven. My mother-in-law cooks almost everything in cast iron. We’ve never been intimidated by Dutch ovens because we spent too much time around them as children. 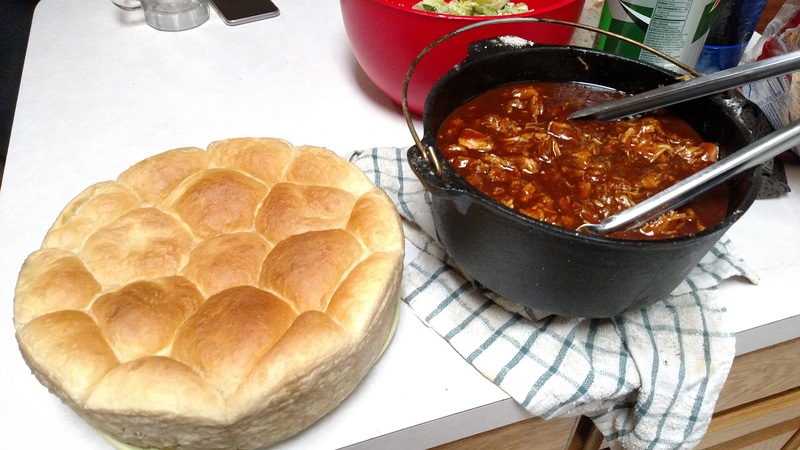 We’ve met a lot of people, however, who see Dutch ovens as either terrifying or full of voodoo magic. You can use this to your advantage. 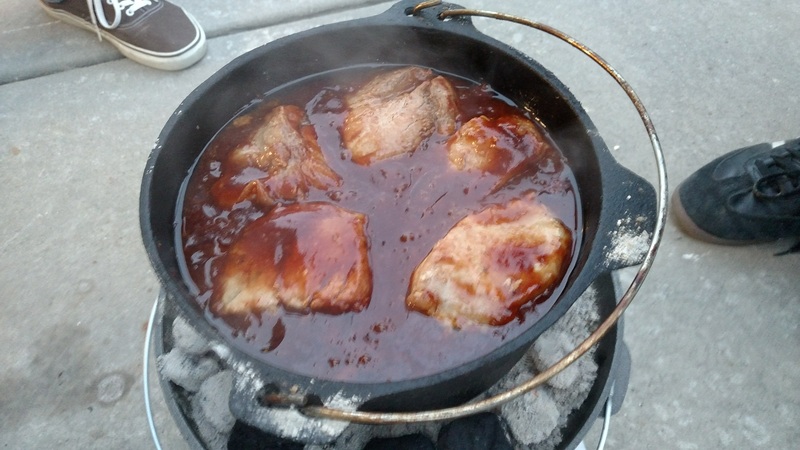 To the uninitiated, whipping up literally anything in a Dutch oven will give you master outdoor chef status. This is not nearly as difficult as it sounds. If you have a new Dutch oven, heat your oven or grill to 350 degrees, placing a cookie sheet wider than your Dutch oven on the bottom rack. Use a scouring pad and scrub the whole thing under hot water. Dry thoroughly, then rub shortening all over the oven and lid, inside and out. Use a paper towel or rag to get it into all the little dimples. Place the Dutch oven and lid (separately) upside down in the oven, making sure the cookie sheet will catch any dripping oil. Bake the Dutch oven for an hour or so. Remove with hot pads and wipe off any excess oil. Charcoal can be a pain to get started, especially if you’re armed only with a match on a windy day. But if you’ve got a charcoal chimney and a torch, it only takes a few seconds to get it going and a few minutes to have a batch of hot coals ready to cook. If you don’t have a torch, I would use matchless charcoal so you can avoid frustration and profanity. To get a 12-inch Dutch oven to 350 degrees, you need 24 briquettes. For most foods, you’ll want twice as many briquettes on the top as on the bottom. You may need to replace some as the cooking process continues. You should also pick the Dutch oven up and turn it a bit every once in a while to make sure everything cooks evenly. And there you go. Delicious outdoor cooking without hard work or culinary school.